I’ve had two treatments now with Acu & Herbs, to help treat Chronic Fatigue, chronic headaches and depression, which I’ve had for about 8 years on and off. After just one acupuncture session I felt really different – physically and mentally lighter, more positive and optimistic. My energy and mood improved almost straight away, and has been steadily improving since. I’m also taking herbs to treat my liver, and they are not as bitter as I was warned, quite palatable actually! Dr Han is very gentle but clear-sighted and professional. I will be continuing my treatment as Acu & Herbs and would recommend them highly to anyone seeking complementary health support. I have had sciatica for over a year and was recommended by a friend to try acupuncture with massage. Eight weeks later I can touch my toes again and do short runs without pain. Dr Han is amazing. I was very skeptical as have had bad experiences in the past but would definitely advise anyone to drop in and have a chat, whatever the problem. He is a polite professional man and I am so glad to have been treated by him. I can’t thank him enough, I have my life back. 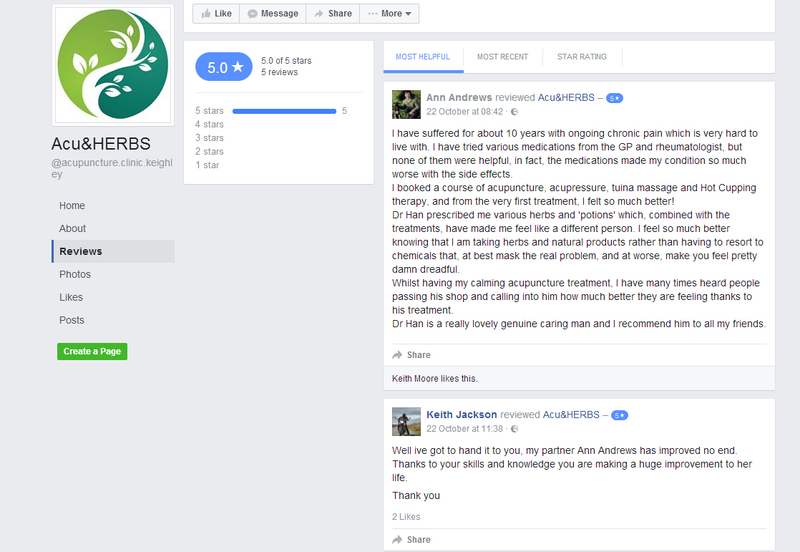 After suffering progressively worse migraines for 20 years and having found conventional medicines of little use I sought the help of Dr Han at Acu & Herbs. I am so glad I did as the severity and the frequency of the migraines has reduced to a point where I am now able to enjoy life again. Dr Han offers a professional service from diagnosis to a full course of treatment – all delivered in a caring and sympathetic way. I had acupuncture, herbs and massage over 10 sessions and the improvement in my health was apparent from the first session. In addition and unlike conventional medicines there are no adverse side effects. By the end of the treatment I felt better than I had done for many years. I have no hesitation in recommending Acu & Herbs. Dr Zheng Han is kind, relaxed, courteous & helpful. He’s very advanced in his knowledge of acupuncture. In the past 3 years I’ve seen him 10 times, what he does is so effective. I’ve suffered severe chronic back pain for around 15 years, I’ve seen chiro/physio, had facet-joint injections, all repeat treatments because of intense pain that just won’t go away. Left leg & lower back, pins & needles, cramping up, going numb & weak etc. After first treatment, I would say all symptoms were reduced by 70%, I couldn’t believe it. The week after he treated me again I was just about pain free for 3 months! Dr Han’s treatment is so relaxing & effective, he definitely is the real deal, trained in China he’s practiced for some 20 years or so now. Authentic traditional acupuncture, a deep massage & then cupping, all leaves you very relaxed & revitalised. Dr Han is very very good at alleviating pain & relaxing you! Thank goodness I found this guy!! I have suffered for about 10 years with ongoing chronic pain which is very hard to live with. I have tried various medications from the GP and Rheumatologist, but none of them were helpful, in fact, the medications made my condition so much worse with the side effects. I booked a course of acupuncture, acupressure, tuina massage and Hot Cupping therapy, and from the very first treatment, I felt so much better! I came to see Dr Han in 2015 for treatment as I had had 2 miscarriages and was struggling to get pregnant again. The sessions were really relaxing and enjoyable. After only 11 sessions, I found out I was expecting. I am now 4 weeks away from delivering my little girl and we are over the moon. I came to see Dr Han after I’d started IUI treatment with my first child which had been unsuccessful. After about 9 sessions acupuncture treatment, I had IUI again and it worked. I came to see Dr Han again before my IVF treatment with our second child, and the IVF treatment worked 1st time! I would recommend Dr Han to anyone — he is fantastic! If I hadn’t witnessed what acupuncture can do I would not have believed it! Unable to work or walk due to severe back pain, 1 session l was back on my feet, 2nd session l was back at work! Please give it a go, what’s the worst that can happen? Thank you Acu & Herbs! I have been here several times, tennis elbow, sinusitis and recently gallstones. I can’t recommend highly enough. My husband had treatment for a dislocated shoulder, having tried other treatments he couldn’t believe how quickly he was able to move his shoulder. Remember if you have health care insurance you may be entitled to half of the cost back.